 Beier N, et al. J Cardiovasc Pharmacol, 1991, 18(1), 17-27. Brunkhorst D, et al. Naunyn Schmiedebergs Arch Pharmacol, 1989, 339(5), 575-583. Kajimoto K, et al. Br J Pharmacol, 1997, 121(8), 1549-1556. Iwasaki A, J. Am Coll Cardiol, 1999, 33(5), 1400-1407. 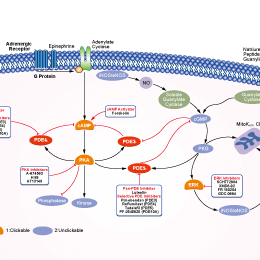 Features:Much more potent to PDE-5 than PDE-1 or PDE-6.